View of mural depicting Central School, Village Hall, St. Joseph Church and an Indian Trail tree. 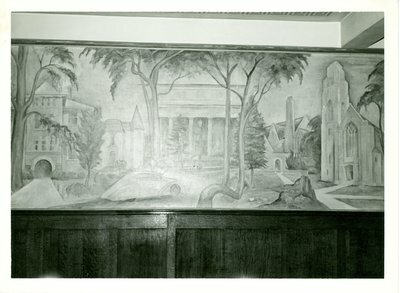 The mural was formerly in the Wilmette Village Hall. Mural is now located at the Wilmette Historical Museum. Stamped on the reverse "Photo by Bill Kuiken, 1337 Washington, Wilmette, IL"